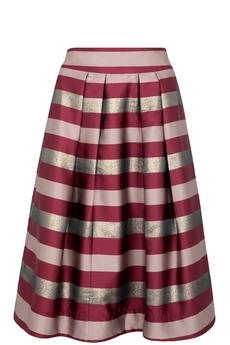 Lucinda Ballroom Midi Stripe skirt is a stunning piece for new season's special occasions and parties. Is made from bordeaux, antique pink and gold bold stripped satin fabric in a voluminous box-pleated A-line style. Sits just below the knee with wide angled pleats and flattering waistband with pockets. Has concealed back zip fastening, is not lined and is approx. 76cm in length. Winter collection. Composition: 95% Poly, 5% Metallic.